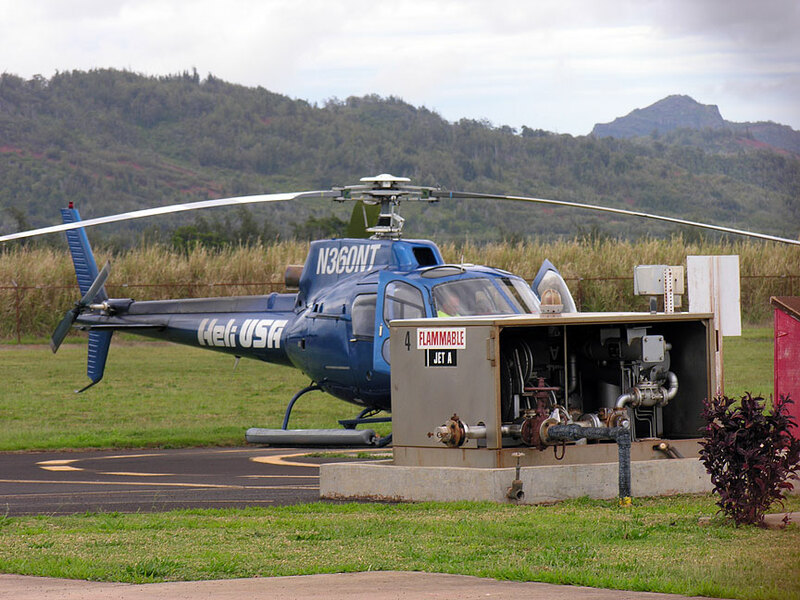 LIHUE » The loss of the tail rotor appears to be the cause of Sunday's Inter-Island helicopter crash in Haena that killed a passenger and injured the pilot and three others, National Transportation Safety Board officials said yesterday. Brian Rayner, lead NTSB investigator, also said that flotation devices have been ruled out as a cause of the Thursday crash of a Heli USA Airways copter. Rayner said yesterday that pieces of the tail rotor and gearbox from the Inter-Island helicopter were found by divers yesterday in waters off Haena. Witnesses reported seeing two pieces fall into the ocean just after two loud noises were heard from that craft. The pilot struggled to fly the craft, witnesses told investigators, and found a field on the North Shore before the helicopter began a flat spin. Rayner said a bird flying into the aircraft could have caused the tail rotor to come off, but evidence of that has not yet been found. Michael Gershon, 60, of Walnut Creek, Calif., was killed in Sunday's crash. Pilot Donald Torres, 30, was treated and released from Wilcox Hospital. Passenger Dania Hansen, 60, of Los Altos, Calif., is at Wilcox Hospital. 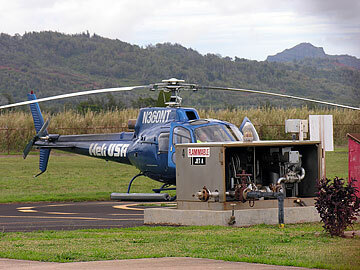 Two other passengers, Douglas and Judy Barton, both 60, of Newport, N.H., are in Oahu's Queen's Medical Center. LIHUE » After reporting hydraulic problems, pilot Joe Sulak was flying at a normal angle as he approached Princeville Airport on Thursday to do an emergency run-on landing, and the flotation devices were not deployed, investigators said yesterday. The engine was tested, and it also appeared to be working properly, said lead investigator Brian Rayner, of the National Transportation Safety Board. And the run-on landing "is something that (pilots) are trained to do," said Rayner, who is also a helicopter pilot. Sulak, a pilot with more than 30 years' experience, had practiced a run-on landing as part of a fly-along the previous week, said Nigel Turner, chief executive of Heli USA Airways. So investigators are concentrating on what caused the helicopter to run cockpit-first into the ground, about 200 yards from its normal landing pad in an accident that killed four people and injured three others. Every piece of the hydraulic system will be tested for leaks, Rayner said. And the entire hydraulic pump will be shipped back to the NTSB lab in Washington, D.C., to be thoroughly tested. A failed hydraulic pump was the cause of a hard landing for another Heli USA helicopter at the Grand Canyon in 2002. The flight control system will be looked at, as well. "Right now, it's too early to tell what's (an anomaly) or not," he said. Since so many pieces of the craft are broken, investigators must first figure out which ones broke upon landing and which ones might have broken in flight. Rayner said he also expects to interview the lone witness of the landing today, as well as the company's dispatcher, to get more information on the helicopter's last moments before the crash. Yesterday, Rayner was able to return to the Heli USA crash investigation after starting the query into Sunday's crash of an Inter-Island helicopter that killed a passenger and injured the pilot and three others. An NTSB team arrived from the mainland to conduct that investigation, augmented by members of the Honolulu office of the Federal Aviation Administration. The FAA investigators, already at Princeville Airport looking into the Heli USA crash, beat some of the ambulances to the scene and were able to interview witnesses shortly after Sunday's crash. 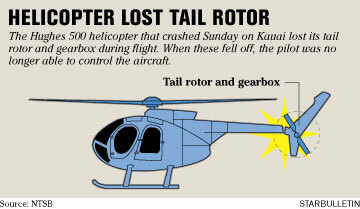 The cause of that crash was the loss of the whole tail rotor, the mechanism that turns the rotor and part of the rear gearbox. It appears the Inter-Island chopper lost them right before the landing at the YMCA Camp Naue in Haena. But why the components broke off has yet to be answered. They did get a break when divers found at least a portion of what fell off the craft yesterday, in waters near Haena beach. 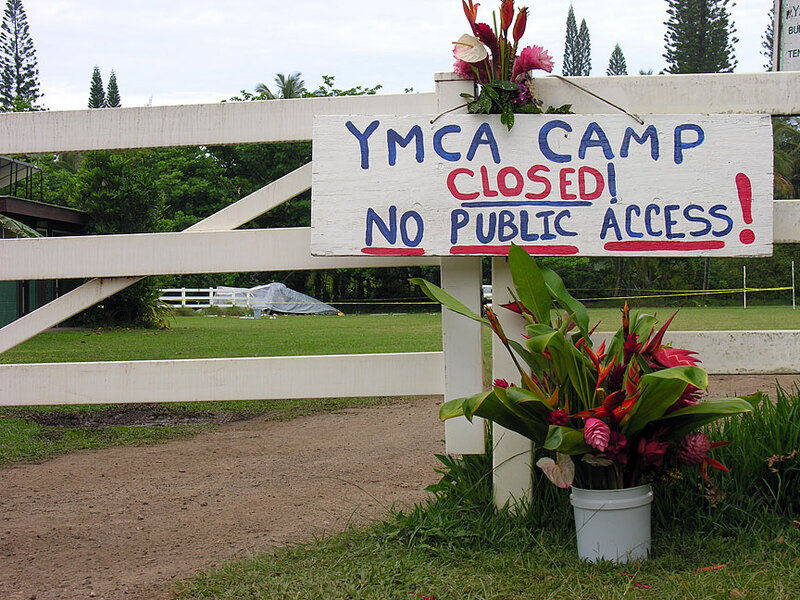 Witnesses said Sunday they heard two loud pops and saw two pieces of the helicopter fall just before it crash-landed in a field at the YMCA camp. The helicopter "was in obvious distress," with the engine making unusual noises, witnesses told investigators, Rayner said. The rotor was observed teetering back and forth as the helicopter rapidly descended, starting out over the water and ending up over the tree line, Rayner said. "This pilot was dealing with a very significant emergency," he said. A bird could have possibly flown into the rear rotor, causing the damage, but there is no evidence of that happening. However, Rayner had yet to look at the pieces recovered by divers yesterday. "I'm curious to see what they found," he said. The NTSB investigators will "go through the same process we've gone though," Rayner said. He expects to be done with a preliminary report by next week. And it is likely that after the on-site investigation, the two helicopters will end up side by side in the Lihue Airport hangar. It is "very unusual," he said, but not unprecedented to have crashes so close together. "They're random events," he said.